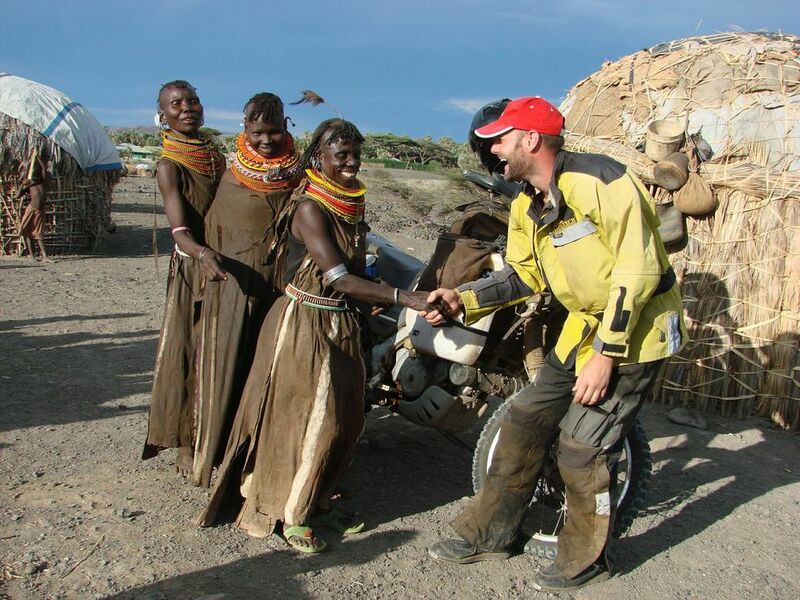 At 33 years of age, Rene Cormier sold all his material possessions and decided to travel the world by motorcycle. Five and a half years, 41 countries, 154,000 kilometers (95,000 miles) and countless memories later he returned. Now in his 4th year of Renedian Adventures, specializing in motorcycle tours in southern Africa, he wouldn’t change a thing. Enjoying life as the PR person for Rock Shox (bicycles) in Colorado, Rene found himself out of work when the company was sold. His position was moving to Chicago and although he was offered a transfer, he didn’t think he’d be a good fit with the new marketing group. After giving 4 months notice, he went to Alaska for a month’s vacation, where he met two guys from South America, there on a year’s trip. They suggested he go to South America by motorcycle and the seed was planted. Although he’d had a pipe dream of traveling the world, never in his wildest dreams did he ever think he’d do it. The idea grew, but he was going to be limited by cash. He thought it would only be for 3 years, because that’s as much money as he had. After checking out websites of other travelers, Rene figured he could do it on $25-30/day. Selling everything he had brought in less than he’d planned but he still had enough for 3 years so he planned accordingly. His US work visa was tied to his job, so he was moving anyway. Either everything was coming in a big truck to Canada and put in storage while he looked for a job, or he was going to give it to friends. So he just sold it. Telling friends he was going created self-induced pressure: once he told them, he had to carry through. Not once has he had a moment of regret about taking the trip or the money required. Fears about international travel in remote areas. In South Korea with little money, he was ready to come back. He’d been on the road 5 ½ years, 4 ½ years of them on the move. To visit the remaining countries he wanted to see, would take another two years and he didn’t have enough funds for that. He’d done what he’d set out to do; it was time to go back for whatever was next. On his return to Edmonton, Alberta, Canada, Rene was 39, with very little money but as he points out, at least he didn’t owe any money. He found a “luxury” basement apartment, started working on construction and began writing The University of Gravel Roads . He didn’t know how to write or publish a book, but he also hadn’t known how to ride around the world. He began asking questions, gnawing away and it worked out. “When you’re traveling around the world, you’re not going to worry about where you’re going to find fuel on the 6th day of the 4th year. “ He didn’t even know what continent he was going to be on. All he needed to do for today was get from where he was to 2-3 hours away. And that’s pretty manageable for most people. The next day, your only task for the day is to find your way from that place to another 3-4 hours away. It’s the same approach he used for the book. Rene made a last minute decision to head south from where he was to Capetown instead of north to Yemen. 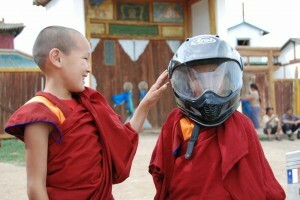 There he met someone on the beach who would be his introduction to motorcycle tours and Colette – his future wife. He kept in touch with both of them over the next two years of travel, not knowing where either relationship would lead. The guy on the beach happened to be doing motorcycle tours up to Namibia and they decided to give a touring partnership a go. They’re now in year 4 and have doubled in size every year. 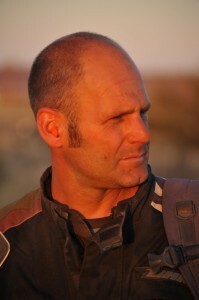 He and Colette eventually married in 2010; Jacques Rene was born 9 months ago in Capetown. They spend half the year in Canada and the other half in southern Africa, where he loves showing people a very special part of the world. Many people never knew they could do it by motorcycle. Most importantly, they want to get away from the logical unknowns about planning such a trip, which can chew up their time. Renedian Adventures’ tours get away from big cities right away. They travel in Namibia or the western side of Africa which is sparsely populated. The biggest risk travelers face, greater than malaria or pick pockets, is a motor vehicle accident. People feel a connection to the place they’re in, especially through the gravel roads. 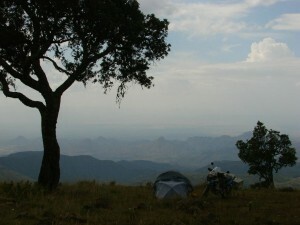 They didn’t realize how safe it was, how empty some of the places are and how beautiful South Africa is. And seeing the animals up close is very special. Rene observes that all travel has inherent risks, as does getting out of bed in the morning. But he maintains the risks that people perceive for international travel, seem much bigger than they are. Now in his 80’s, Ted Simon, author of the Jupiter’s Travels books, wanted to make a way for people who do these trips to have a way to communicate their trip in some way – i.e. writing, film, interpretive dance. Rene is on the committee of advisors and helps evaluate the applications. Depending on the project, he can also offer specific help. He’s quick to point out that not everyone that does a big trip needs to communicate it. It can be intensely personal. About living his life, his way! “There is no way that I would have been able to tell when losing my job would end up like this,” says Rene. Now banks want 5-10 year plans – it’s a complete exercise in paperwork.” He hasn’t had a pay cheque in 10 years and wouldn’t go back to structured employment for any amount of money. The best way to reach Rene – is via email: renedian@mac.com. 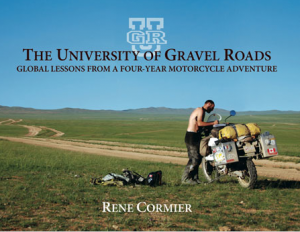 Filled with captivating stories and photographs from his world travels, The University of Gravel Roads is about life lessons learned on his global adventure. Wow! What an adventure, what a guy. I hope he, his wife & baby, can keep up the adventurous life while raising a family. He sure is Mary! If anyone can do it, they can. I met Rene at th salon moto in Montreal 2012 fascinating man and wonderful family. Was lucky enough to buy his book and a signature as a bonus ! Hey rene. Best wishes in all that u do. You are fulfilling your dream. That my friend is the greatest achievement yet! You and I have met several times mostly at the edmonton motorcyle shows. ( I asked you the first time if you were wealthy, boy was I wrong). Then I read your book lol. My girlfriend is nina whom u have also met. . As you affectionaletly wrote in my copy of your book. “All the best to you and nina on your future gravel roads”. We both now have our bmw650s . Here’s to seeing u one day on the road! Cheers Erwin and nina. What a touching message Erwin. Rene is certainly inspirational and you’re fortunate to have crossed paths. He’s on tour in Africa right now and I’ll pass on your message. All the best to you and Nina with your motorcycle adventures! Thanks for the kind words, Erwin. And David and Mary! Mine is an unusual story, and one that I am happy that readers find entertaining, even a bit inspirational. Colette, myself and baby Jacques are continuing our unorthodox lifestyle by staying busy on the road. Let’s catch up at the shows this year. And my thanks again to Liz for her hard work in getting this awesome podcast out. Cheers from Africa! Hey Rene – you are indeed more than a bit of an inspiration to many by living life following your own compass. Thank you for your courage and leadership. All the best to you, Colette and baby Jacques!